Evidence-Informed Musings: The Annual Cochrane Pilgrimage…my first one ever! The Annual Cochrane Pilgrimage…my first one ever! In this blog-post, Rebecca John, Research Scientist at the South Asian Cochrane Centre, recounts her experiences of organizing and participating in The 22nd Cochrane Colloquium held at Hyderabad, India. Rebecca John (holding bouquet) at the closing ceremony of the 22nd Cochrane Colloquium. It was a little over a year ago that I responded to an advertisement for the post of Research Scientist for the Effective Health Care Research Consortium that was published by the South Asian Cochrane Network and Centre (SASIANCC), hosted at the Professor BV Moses Centre for Evidence-Informed Health Care and Health Policy at the Christian Medical College, Vellore, India. Dr Prathap Tharyan, the Director of the Centre, was by no means a stranger and having sat through many sessions by him during my Public Health course, I was eager to step into the world of ‘Cochrane’! 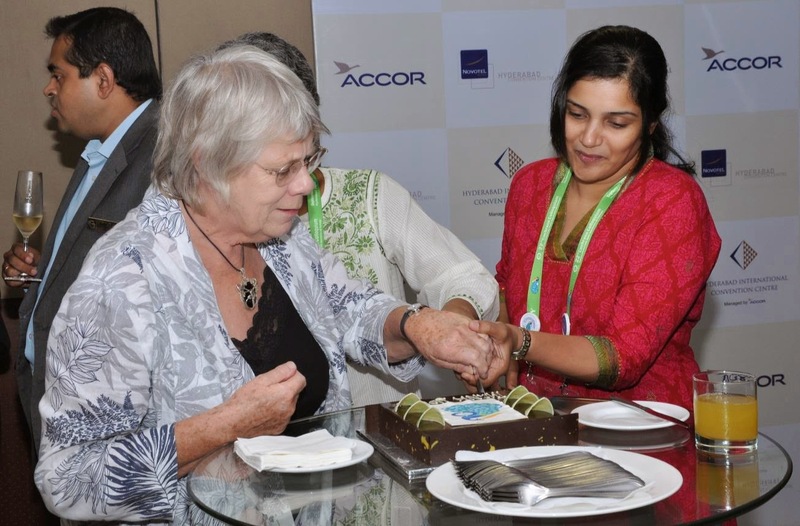 The first step towards gearing up for the 22nd Cochrane Colloquium was a trip by the SASIANCC team to Hyderabad in October 2013 to look at the venue in more detail and also to find the best possible accommodation for varying budgets. After the trip, each of the team members was allocated a role as part of the local organising committee. I was given the task of helping out with registration and accommodation. A bit daunting at first, but with the help and support of other team members it turned out to be a great experience! With the start of registration on 3rd of March 2014, it was like the floodgates had opened…we had the usually starting hiccups but within in a few days we were all working together and had things up and running like a well-oiled machine ! The last two weeks….Before we knew it September had crept upon us and the mood at SASIANCC was something similar to that at Santa’s residence the night before Christmas! Everyone was hard at the tasks assigned to them; with no time for chit chat or even coffee breaks. We all had but one goal in mind and that was to make the 22nd Cochrane Colloquium a memorable one for ALL our delegates. On a personal note, it being my first Colloquium ever… was that it was a memorable one. It started off with the Evidence Aid Symposium, and an opportunity to finally meet up with many of the lovely people I had been emailing over the past few months. By the end of the third day I guess the Cochrane Colloquium spirit just took hold; meeting up over coffee or lunch with people from various centres and groups was all too exciting!! From a professional point, it was really great to meet people who have been involved with Cochrane in various capacities; some newcomers like me, and some who had been giving of their time and talents to the Collaboration for decades. What struck me most was that Cochrane is all about networking, and in reality Cochrane is truly a ‘Collaboration’ of people who are NOT trying to getting ahead of others (like so many other professional bodies!!) but of those trying to work across geographical and cultural borders for ‘Trusted evidence, Informed decisions & Better health'. The 2nd Annual Cochrane Lecture ‘Evidence-based Medicine and The Cochrane Collaboration: a McMaster perspective’ delivered by Professor Gordon Guyatt was in all senses the highlight for me. Prof Guyatt kept the delegates not only engaged but thoroughly interested for a whole hour. Now looking back it seems like a dream.. and all too soon the curtains fell on the 22nd Cochrane Colloquium... with a thrilling Bollywood Dance-off (where I put on my dancing shoes after a break of 20-odd years!) serving as a fitting finale. But, while it felt so good, I also felt a sadness come over me as it was time to say goodbye to the many lovely people I had met. On a positive note, I walked away inspired, enthused and motivated to strive harder to ensure that the ‘Not just evidence but the right evidence’ gets out there! Auf Wiedersehen & Wir sehen uns in Wien !! Representation of women as editors in the Cochrane Collaboration published in the Journal of Evidence Based Medicine (doi:10.1111/jebm.12123). Top Maternity Hospitals in India makes available the services to support business, training programs & research services telemedicine services, education, and a host of other non-profit projects to enhance performance and service to customers.